For most people, baking in August is anathema. But given the glorious weather on this August day, I thought, What the hell, let me bake a cake. Yesterday, I went fruit and vegetable picking at Lawrence Farms in Newburgh, NY. We collected peaches, plums, peppers, corn, and raspberries. As we paid for our produce, a gigantic black cloud loomed overhead and spilled gallons of rainwater upon us. An organic vegetable rinse. A coworker recently sent me a recipe for strawberry summer cake. I had wanted to try it out, but recognized that strawberry season had passed. 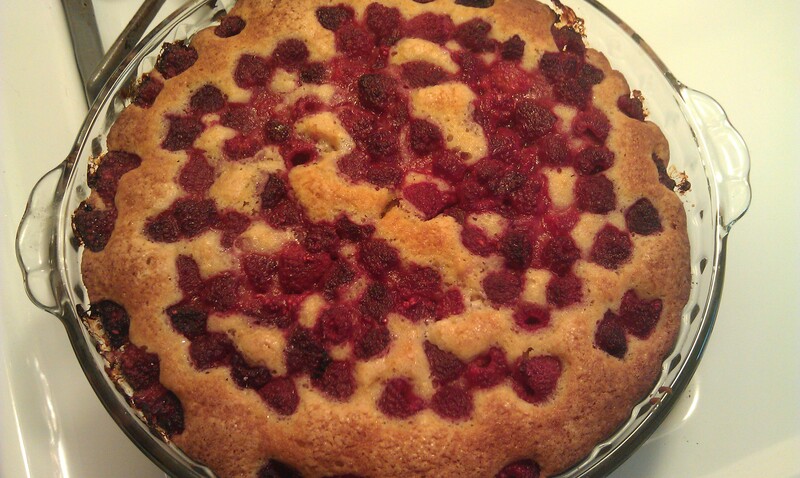 Fate dropped an entire pint of raspberries in my lap, so I decided to bake the cake with raspberries, instead of strawberries. The results? A fine not-too-sweet cake filled with delicious, fresh-picked raspberries. The recipe recommends some fresh whipped cream to accompany the cake. I may have to take a trip to Met to buy some.